Historian Robert L. Gold has authored numerous books and articles and serves as a Florida Humanities Council speaker on such topics as Characters and Crooks in Florida History. His 1973 Florida Historical Quarterly article That Infamous Foridian, Jesse Fish won the 1974 Arthur W. Thompson Prize in Florida History. Robert L. Gold at microphone. 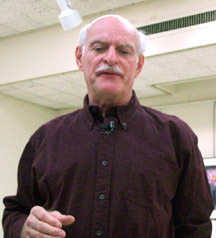 Above: Dr. Robert L. Gold gives a talk at the Ossining Public Library May 16, 2001 about his research for the article. 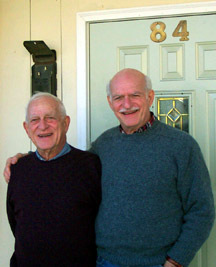 Below: Left -- the author's older brother, Michael ("Merton"), a retired OB/GYN physician. Right -- the author, Robert. a Ph. D., retired professor. They are standing in front of 84 Croton Ave., Ossining, NY., formerly home of Fanny Gold & Son Confectionery. Michael attended high school across the street from the store. the University of the Americas in Mexico. In the 1970s, Professor Gold presented a variety of college courses at prisons in Illinois: Marion Federal Penitentiary, Menard Maximum Security Facility, and two medium security facilities -- one in Centralia, the other in Anna. the Red River Valley Historical Review. His article "Babe Ruth at Sing Sing" is to be published this summer in The National Pastime. Ellen Sexton of the Lloyd Sealy Library, John. Jay College of Criminal Justice. 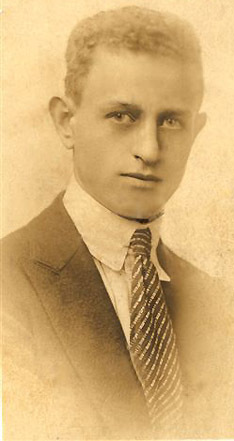 Above: Photo of author's father circa 1922. Below: Photo of author's mother and father, Henry and Ernestine (Esther) Gold, June 1920. Bronx County Courthouse, County Clerk's Office. Lloyd Sealy Library, John Jay College of Criminal Justice. New York Correction History Society. New York State Archives, Albany. Society for American Baseball Research, Cleveland, Ohio. Lewis E. Lawes Papers, Lloyd Sealy Library. Lawes, Lewis E.,Life and Death in Sing Sing. New York: Doubleday, Doran & Company, Inc., 1929. Lawes, Lewis E.,20,000 Years in Sing Sing. New York: Ray Long and Richard B. Smith, 1932. Seymour, Harold,Baseball: The People's Game. New York: Oxford University Press, 1990. Brant L. Kehn, Former First Deputy Superintendent, Sing Sing Correctional Facility. Historian Spring 2002 front cover. 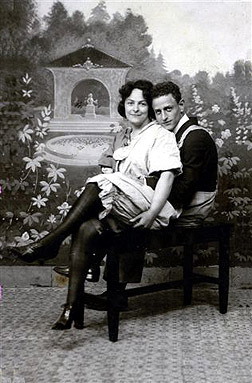 The Coney island honeymoon picture of his parents became the front cover photo for the magazine issue featuring Robert L. Gold article Searching Sing Sing for My Father. The first inside right hand (odd numbered) page of that issue, Page 35, provided brief descriptions of the featured articles. The wording of the Page 35 description of Dr. Gold's article appears in the text to the left of the above image of that description referring the reader to Page 36 of Spring 2002 issue. Below is an image of the headline appearing in that issue's Page 36 announcing the story. Page 36 headline for Dr. Gold's story. Cover picture: Harry and Ernestine (Esther) Gold at Coney Island, during their honeymoon, June 1920. Courtesy of the author. The Westchester Historian is published quarterly (ISSN 0049-7266) by the Westchester County Historical Society, 2199 Saw Mill River Road, Elmsford, New York 10523. Subscription to the journal is included in membership dues: $35 Member; $60 Contributor; $100 Friend; $150 Sponsor; $250 Benefactor; $500 Patron; $1000 Sustainer. Libraries subscribe at $35. Back issues are available at $5 each plus $ 1 postage/handling. Historian Spring 2002 Page 35 nameplate. Contact and other revelant information about the Westchester Historian appeared on Page 35 and is repeated here. Roger Panetta, listed on its Editorial Advisory Board, also is a founding member of the New York Correction History Society. Complete or partial sets of all back issues are available at a discounted rate (address inquiries to WCHS). Volumes 1-65 are available on Microfilm for $200. A complete index to Volumes 1-65 is available for $25 and to Volumes 66-77 for $10. The Histonan is also indexed in the Periodical Source Index (PERSI). Copyright 2002 Westchester County Historical Society. the Harry N. Gold portrait photo. All other images have been added by the webmaster to the presentation for purposes of enhancing the graphics design and providing interesting historical or background information. The webmaster is solely responsible for the wording of all captions. NYCHS appreciates Michael H. Siegel, Ph. D., a retired Professor of Psychology, making available to us his Ossining photos of longtime friend Robert L. Gold at the microphone and with his brother, Michael M. Gold, M.D.,in May, 2001. 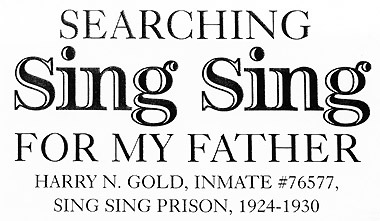 NYCHS presents original text of Robert L. Gold's Searching Sing Sing for My Father by permission of its author. A somewhat shorter version appeared in the Spring 2002 issue of The Westchester Historian. NYCHS appreciates receiving the permission of both the author and the publication to make this presentation. All copyrights remain reserved and retained. For information about that Westchester County Hisorical Society publication, visit The Westchester Historian web page.